Since 2006, the Interfaith Encounter Association has been organizing the collecting of Chametz (leavened food that is forbidden to be eaten by Jews during Pesach) from Jewish families and then distributing it to Christian and Muslim families in East Jerusalem who are in need. During both collection and distribution we are fully transparent; while collecting we make it clear that the Chametz will be delivered to needy families in East Jerusalem and upon delivery we stress that the food comes from Jewish families in West Jerusalem. The Chametz has reached many different recipients: an old-age home in Silwan, families supported by the Al- Manar organization in Wadi Joz and some families supported by the Al-Razi organization in Al-Ram. This year we conducted the project in cooperation with the Sephardic, egalitarian “Degel Yehuda” Community in Jerusalem. Below are some of the reports we sent out after the operation. In an earlier encounter we studied how Judaism and Islam recognize the possibility of giving charity to people of other faiths. We therefore realized that we can put this study into action and discussed ways to do so in the beginning of April. We printed announcements advertising a way to get rid of Chametz and to help other families in the process. We publicized the phone numbers of the group’s activists and their respective living areas in Jerusalem. In addition, we appointed contact people in all three campuses of the Hebrew University. We did not stop there. In one of the evenings before Pesach we met at Nachlaot neighborhood in the city center, to collect leaven from the nearby houses. We divided into pairs, making sure each pair consisted of one Muslim and one Jew and one man and one woman. Visiting these houses was a very special experience . Many of us took part in several interfaith encounters and events, which usually happen in a very good atmosphere due to the simple reason that those who come are either already happy to meet people of other faiths or at least are open enough to make the effort. In this visit to the neighborhood we could not predict who will receive us with warmth and who will slam the door. It was a real “gamble”. Sure enough, there were people who refused to donate once they understood that the food was designated for Arabs. Some protested: “would Arabs collect food in this way for poor Jews?” For us it was a reminder of the environment in which we operate, how deep the mutual mistrust between the two people is and how long the road is ahead of us. Whoever wants to act and make impact should not delude themselves and must understand the complexity of the reality. Despite this, we were pleasantly surprised by most of the responses. The vast majority donated. Some even added sums of money, beyond the leaven product that were meant to be burned anyway. We left the neighborhood with large quantities of food and it was clear to us that if we had more time and more volunteers we would have collected a lot more. We learned much from this round in the neighborhood on that evening. We were filled with hope for reconciliation and understanding when we saw that, contrary to what we expected, most people agreed to donate for people of the neighboring nation, despite the on-going state of war. We think that the residents of the neighborhood also gained something from this evening, beyond the opportunity to donate to the needy. It does not happen every day that you are visited by a Jewish young man and a Muslim young woman (or a Jewish young woman and a Muslim young man). It is most likely that this was the first time most of these households saw young Muslims and Jews working together for a common cause. Perhaps this too was a small contribution to the reconciliation process between our two peoples. The next and last phase of this operation was the distribution of the collected food. Unfortunately, most of the Jewish members could not come. Those who could were afraid to go into the Arab neighborhood in East Jerusalem (Siluwan) where the food was distributed. Here we have another example of where we should not delude ourselves. The reality of the security infrastructure of the Holy Land partially compromised our plan of having Jews and Muslims to go together in an Arab neighborhood to distribute food to the needy. Indeed the road is long. But as we all know, even a journey of a thousand miles begins with one small step. We would like to stress that when bringing into account the number of members who participated in this operation and the actual time dedicated to the activity, the amount of food collected was quite impressive. During the two hours of going from house to house in the neighborhood of Nachlaot we managed to collect more than 150 Kg of food. The food we collected included rice, different pastas, sugar and sweets. Many of the products were not even leaven but still were generously donated to us. When we planned the operation, we thought it would be the right way for the Arab Muslim members of the group to actively and openly participate in the collection, so that we can expose our activity to the wider public. And indeed Jewish and Muslim members were going around the Jewish neighborhoods of West Jerusalem together and in full partnership. The planning was that also when we distribute the leaven to Arab needy (Muslims and Christians) the Jewish members will participate actively and openly in order to get the same desired effect in the Arab population of East Jerusalem. When we were looking for an institution to deliver the food to, we were surprised to discover fear and suspicion from the Arab population in East Jerusalem. It was even suggested by one of the locals that the Jews were trying to poison them. This query opened our eyes to the huge breach and the enormous suspicion that exists between the two sides. This remark only intensified our belief that we have to continue our efforts and that there is still a lot of work for us to do. Such remarks also forced us to accept only sealed food packages from the Jewish donors. Finally, after exploring different institutions, we gave the collected leavened food to an old peoples’ home in East Jerusalem, which is funded by private donations and is not supported by the authorities. To our regret, the Jewish members could not come on the day of delivery due to various reasons. Some feared for their safety. We need to report this because it is important for us to present things as they are, and not paint a pretty picture of how we’d like things to be. In any case, this fear intensified our thinking of how much we need to continue vigorously working to bridge these worries and breaches. The absence of the Jewish members from the distribution slightly diminished our momentum and the effect we were aiming to achieve in this operation. We planned on exposing the Arab society in East Jerusalem to religious young Jews who are “different” than how they might be stereotyped in Arab society. This would have significantly advanced the idea of our organization and perhaps diminish, even a little bit, the suspicions between the two societies. This absence forced the Muslim members to represent the Jewish side of the group in the food delivery process. During this delivery, we made sure to present our organization and to explain its goals. In addition, we stressed that this food was happily donated by Jewish people from Jerusalem and that the donors clearly knew that this food will be given to Arabs in East Jerusalem. The reaction we received from the director of the old-people’s home, who spoke for all its residents, was warm and welcoming. She asked us to convey, in the name of all residents of the place, their gratitude and appreciation to the donors’ generosity and kindness. The Interfaith Encounter Association initiated a pre-Pesach volunteer project, in collaboration with the Yedidya Community (an Orthodox Jewish community in south Jerusalem), of collecting leaven food from Orthodox Jews and delivering it to Muslim poor people in East Jerusalem. The people realizing the project were VERY pleasantly surprised to see that quite an impressive amount was donate. If there were any more donations, it would have required multiple trips to deliver. 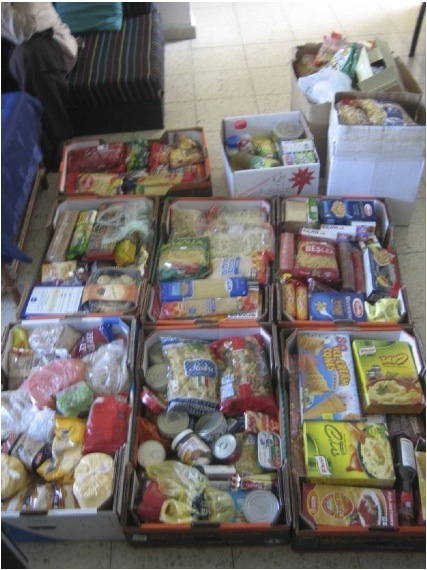 This year, as in previous years, the IEA teamed up with Kehilat Yedidya in Jerusalem to promote food donations. Instead of throwing away food that was “chametz”, or leavened, before the Passover holiday, the food was collected, and with the assistance of Rabbi Bob Carroll and Mr. Salah Aladdin of IEA, was donated to needy Moslem women. This year, once again, a full carload was collected, despite notice having been given only a few days in advance, and the food was delivered to the Al Manar organization for Women.